CORONA, Calif., (July 20, 2009) – The good folks in West Virginia are about to get hit with a “You aren’t gonna believe what we just saw” moment as Monster Energy’s Ryan Capes gets ready to etch his name yet again into the world motorcycle distance jumping record books with what – if all goes as planned – will be the longest jump ever on a 250F motorcycle. Capes’ jump ramps and bikes have arrived to the region of the country locals fondly refer to as West By God, Va., for this week’s (July 23-26) “Mountainfest” – a gathering of bikers, country music fans, the Budweiser Burnout Bike, a “The Came Bronson” tribute to the 1960s/early 70s TV show and, of course, professional midget wrestlers. Capes says he’ll huck his Pro Circuit-tuned Mt. Baker Motor-Sports Kawasaki KX250F out well past the 200-foot range, setting a new world record for the furthest 250F jump. “I dunno, maybe we can fit 18 (semis) into the gap?,” he adds. Mountainfest and the 70,000-plus bikers and onlookers expected to attend will be the first of a number of stops on Capes’ cross-country, record-setting jumping tour this summer. The entire schedule will be released on that shortly, once everything’s shored up here in a couple weeks. Capes says that some sort of record will fall at every event he boots up and jumps at. 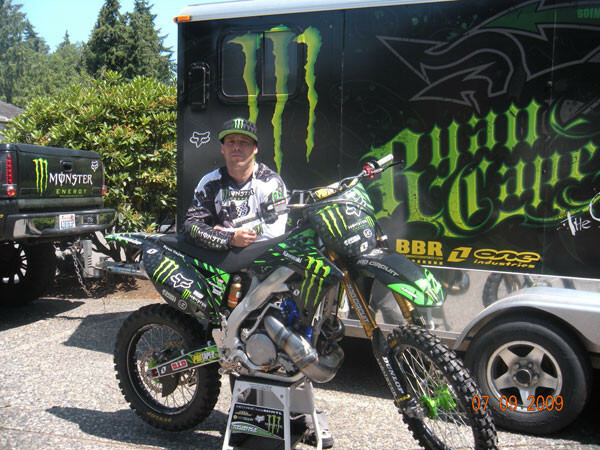 In addition to Monster Energy, Capes is helped out by the following sponsors: Pro Circuit, Ogio, Von Zipper, Fox, Kicker, Uni Filters, One Industries, BBR, Asterisk, KMC Wheels, Works Connection, Skullcandy, Pit Posse, D.I.D, Maxima Oil, Pro Taper, Dunlop Tires, Acerbis, Hinson Racing Components, Boyesen. its cool when he is trying to break as many records as he can. but why not go even bigger? Try to smash maddisons record ? Maddison did it on a 500 2 stroke i would love to see this bike hit similar jump. i have never seem a more weird looking pipe I bet mich did one custom made for cape "cause of the 250F frame" it looks huge compare to maddisons pipe. hmm they write 250F but this is a 250F with a 500 2 stroke engine ?